Ever wonder how Santa manages to deliver all those presents in just one night? Well here’s the hush-hush formula. He uses a special combination of Chinese black tea, peppermint leaves and spices – all sprinkled with real little candy canes. It’s both energizing and remarkably soothing. All Santa needs is one cup and his motto changes from “ho ho ho” to “go go go”. Every year I try to tell my family that Santa would prefer tea instead of milk with the cookies we sit out for the jolly old elf. They don’t believe me, but maybe this tea will convince them! My first reaction – my first sip – was CANDY CANE! It was sweet, minty and delicious. Now that I’ve taken a few sips, it tastes a little less like candy cane (although that taste is still there), and more like a black tea that has been flavored with candy cane. The mint flavor is just right – it doesn’t taste overly minty. It tastes crisp and fresh and exhilarating with a sweetness that is not too sweet. Perfect for dipping your favorite Christmas cookies! 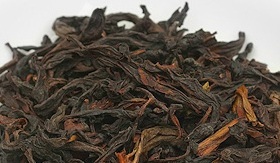 The black tea base is strong without being overly aggressive. It seems to be in perfect harmony with the mint flavor. It is a very well-balanced cup. I find this to be delightful as a hot tea and that’s just what I want this time of year. It has a refreshingly sweet taste that requires no additions, although it might be nice with a splash of milk. Yep, I think Santa would be a very JOLLY old elf indeed if you surprised him with a cup of this tea instead of a glass of milk! I tasted this tea back in January, but I saved the review for it until May because Emerald is the birthstone for May (and my birthday is in May), so I thought it was appropriate. Also, because this tea is outstanding as an iced tea, I thought it would be a good time to highlight some of the better iced tea options. 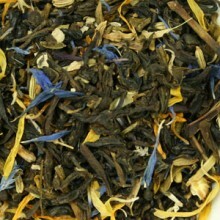 The aroma of the brewed tea smells amazing with notes of flower, tropical fruit and ginger. It is so delightful! When I first smelled this tea, I thought back to the Hawaiian Ginger plant that my gramma had in her back yard. I don’t remember if it smells like this or not – but the tropical/gingery/flowery scent made me think of the Hawaiian Ginger… and warm memories of my gramma are always welcome! The flavor is just as delightful (if not more so!) The green tea is the dominant flavor, but, not by much. It is a nicely balanced set of flavors. 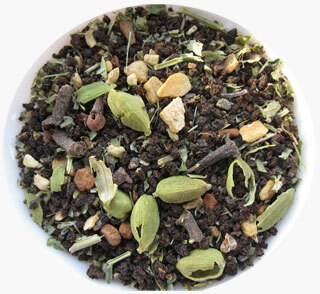 The green tea tastes light and fresh and has a moderate astringency. It has a unique “green” tea taste in that it doesn’t taste grassy or vegetative, exactly. Nor does it have a buttery taste that is sometimes associated with green teas. It falls somewhere in between butter and vegetable, without tasting like either one, if that makes sense. It is delicious though, and melds well with the flavors. The jasmine is the next flavor I detect, followed by the ginger. The ginger doesn’t have that peppery taste, it is more of a mellow spice that nicely compliments the bright flavors of tropical fruit. In the background rests the tropical fruit flavors. I taste pineapple distinctly, but I am finding the other flavors difficult to specifically discern… mango perhaps? Papaya? It tastes sweet and juicy and delicious. The jasmine lingers throughout the sip and into the aftertaste. The unique and delicious combination of flavors in this tea makes it one of my favorites from WhiteAugust! It is delicious hot, but even better iced! Refreshing and exhilarating! 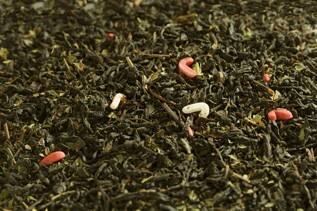 Our buttery sweet Chinese sencha green tea with real freeze-dried blackberries and raspberries and all natural flavors. This is a great treat for these waning days of summer. I think I’m going to make another big icy stein of it right now. Even though 52Teas is one of my favorite tea companies, I’ve only become familiar with their teas within the last two years. 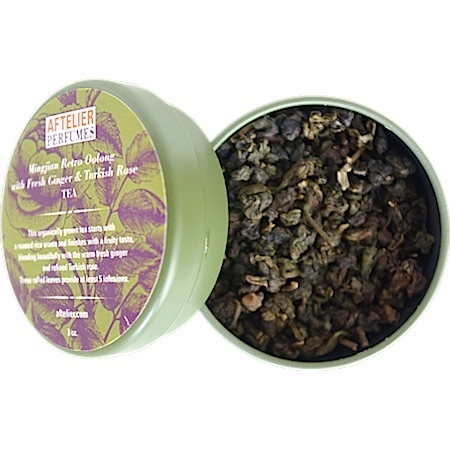 So the limited edition teas that had sold out before I started becoming an avid customer – like this Razzleberry Green – were teas that were sadly out of my reach. Fortunately, back in February, 52Teas offered some sample size packages of some of their retired blends. The samples were random (I didn’t know which samples I would receive), but I was so happy to find this one amongst the samples I ordered. This is really delicious. The Chinese Sencha is light-bodied, buttery and sweet. The “razzleberry” flavor is a combination of raspberry and blackberry, and it is a subtle flavor that slowly develops as I continue to sip. 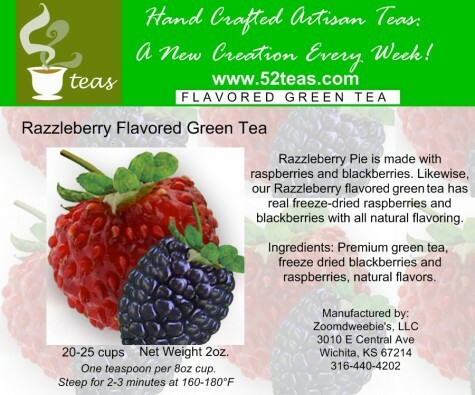 The sweet “razzleberry” flavor seems a perfect match for the creamy flavor of the Sencha. It is delicious hot, but even better as it cools. A very refreshing iced tea! This blend has a light sweetness to it, so I found it unnecessary to sweeten it when it was hot, but as it cooled, I found that a little sweetener (just a tiny drizzle of agave nectar) really brightened the fruit flavor. This is a delightful tea. I wish it were still available so that I could tell you to order some! But I will say this: you should visit 52Teas website and watch for their tea of the week updates (or better yet, just subscribe to their newsletter, you’ll receive an emailed update with information about each week’s tea, as well as updates on any mid-week specials). If you love outrageous flavored teas, there is no tea company out there that does them better! The first time I prepared this, I did so using the package instructions: 1 cup of steamed milk to 1/4 tsp. Latte Matcha. It was good, but, to be honest, I wanted the Matcha flavor to be a little stronger. I felt like I was tasting too much milk. So, the second time I prepared it, I used a little more Matcha (not quite 1/2 a tsp.) and this was perfect for me! The flavor is so rich, creamy, and smooth. Yes, it’s vegetative, but, that’s to be expected. This IS Matcha! It has a wonderfully mild sweetness. There is no bitterness to this Matcha, which I found kind of odd, because I always expect a light bitterness in the background. Perhaps its the milk that offsets the bitterness? I don’t know. 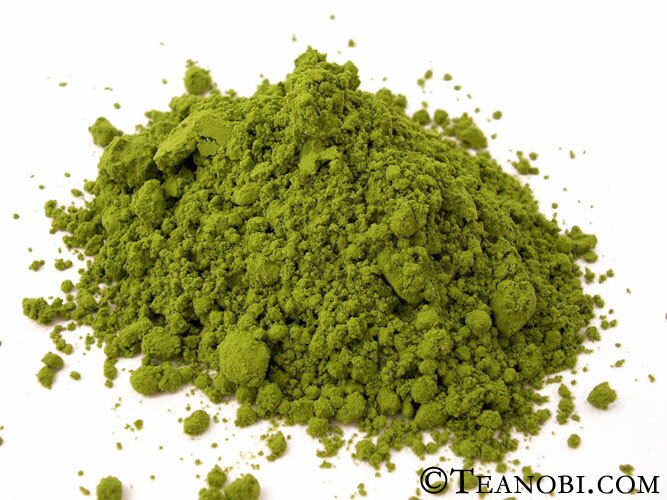 Anyway, for those of you who often find Matcha to be too bitter for your personal taste, try it as a Latte using this Matcha! I think you’ll be surprised at how good this one is! I have blended this using my bamboo whisk (a chasen) and I have blended it using my handheld frother. Both work just fine, although I prefer the handheld frother for the latte. It becomes more frothy and creamy – just like a coffee shop green tea latte. One big difference, though, is that this one hasn’t been sweetened, so you can decide if you want sweetener in it or not. Blend until creamy smooth. Enjoy! Now, I warn you, this smoothie will not have the most appetizing color. But it is delicious, and it makes for a very satisfying (and healthy) meal replacement. This is a great Matcha – at a great price!